Ballroom dancing is a wonderful way for people from all walks of life to get in shape while also releasing their creative juices. This goes past merely benefiting your body; dance can also benefit your state of mind and social connections. Dancing is a great social activity, and it has been proving that socializing regularly can have vast health benefits on self-esteem, stress, and even your BMI. Not many activities are as joyful as artistic dance moves. Concentrating on moving your body to the beat of the music instantaneously puts you in a positive head space. After you get the moves down, it’s pure fun and laughs. Ballroom dancing contributes to muscle toning by forcing dancers to resist their partner’s body strength. Fast turns, spinning and two-stepping all contribute to muscle building. Flexibility is a major benefit of ballroom dancing. Ballroom dancing itself contains plenty of stretching and bending. Therefore the more you dance, the more flexible you will become. 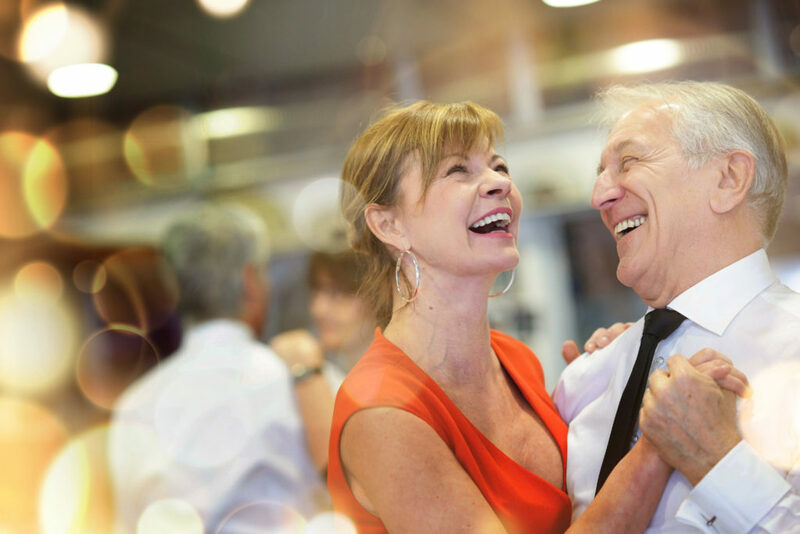 In a 2016 study published in Frontiers in Aging Neuroscience, it was concluded that ballroom dancing, as well as other forms of social dancing, can help prevent the onset of dementia in elderly patients. It was revealed that “dance improved one of the cognitive domains (spatial memory),” which is vital for learning dance (Dafna Merom, et al., 2016). Dancing is a low-impact aerobic activity that can boost your metabolism. In just thirty minutes of dancing, you can burn anywhere between 200-400 calories. That’s roughly the same amount burned by running or cycling. Ballroom dancing is an amazing creative outlet! Not only does it allow you to move your hips at ease to the beat of the music, it also allows you to release your emotions and thoughts through artistic movements. Engaging in just about any cardiovascular or aerobic activity can help improve your heart health, lower obesity and type 2 diabetes risk, and also promote lung capacity. Dancing an effective way to improve general endurance. As the dance sessions get longer and longer, your muscles will be working harder and for a longer period of time. In turn, you will find yourself being able to go on with little to no fatigue. More about Ballroom Dancing at Cornerstone . . .
Our Ballroom Dance classes are taught by the fabulous instructors of Dancers Extraordinaire which was established in 1995. Classes were opened to the general public in the ballroom, Latin, and swing styles of dance. Their classes and experienced staff have expanded to include most forms of dance and exercise for all ages and experience levels. In 2006, Dancers Extraordinaire had the opportunity to join the Cornerstone Clubs to provide instruction for their members as well as the general public. In addition to teaching classes at Cornerstone, every third Friday (check web site for specific dates: www.dancingdancing.com) there is a dance practice/party for the students to practice what they have learned in class. With wedding season soon upon us, please keep in mind that Dancers Extraordinaire also provides private dancing lessons to individuals and couples. For more information, contact Jeff Falabala. Although imitation is a primary learning method, we encourage our dancers to create as well as absorb. Often the simplest activities have the greatest learning possibilities. Many of the exercises act as introductions and preparations for more complex dance movements. Our students are encouraged to use their imaginations during class. Our mission is to ensure that our students have an enjoyable experience. Check out the next session of DANCE AT CORNERSTONE which starts in early January, 2019.